Clive Mendonca was, just like the rest of his family, a Sunderland fan through and through. As a child he had stood on the terraces at Roker Park and dreamt one day of playing for his local team. In the summer of 1997, Peter Reid pondered signing him for the Black Cats but chose to purchase Kevin Phillips from Watford instead. By end of that season, he was to break the hearts of his fellow Sunderland fans at Wembley in the most dramatic fashion. Mendonca was born in Sunderland in 1968. His career as a journeyman striker led him to play for a succession of teams until Grimsby signed him from Sheffield United in 1992 for £50,000. It was an astute piece of business. Under the successful regime of Alan Buckley, the team were playing in the old Division One and Mendonca scored an impressive 57 goals in 156 games to maintain their lofty status. Unfortunately, it couldn’t last and the Mariners were relegated at the end of the 1996/97 season. Finances dictated that Mendonca was now available for the right price, although to this day he remains a legend at the club. Alan Curbishley, the Charlton manager, saw a player who, although lacking pace, was not just a goalscorer but an intelligent footballer, who could bring others into the game with his touch, control and awareness. Sheffield Wednesday and West Bromwich Albion were also considering an offer, which prompted Charlton to agree a club record transfer fee of £700,000 with Grimsby. As Mendonca had spent his whole career playing in the north, Curbishley understood that a move to the smoke could be a trifle intimidating. He personally met Mendonca at Kings Cross station and drove him around the capital, pulling out all the stops to convince him to sign. Worryingly, he didn’t seem that taken with the metropolis. Curbishley later pointed out West Ham’s training ground in Chigwell. Suddenly Mendonca perked up: “Chigwell. Sharon and Tracy come from Chigwell.” Apparently, he and his wife were avid viewers of Birds of a Feather. Where the manager’s charm offensive failed, a BBC sitcom delivered. Mendonca signed and it was arguably the best piece of transfer business the Addicks ever conducted. Sunderland and Charlton had challenged for automatic promotion throughout the 1997/98 season but finished third and fourth, just missing out on automatic promotion, which led to the lottery of the dreaded playoffs. Sunderland defeated Sheffield Wednesday and Charlton overcame Ipswich to set up the final for a place in the Premiership. Clive Mendonca, with 23 goals, and Kevin Phillips, with 29, had been in devastating form. Given that he almost signed Mendonca, Reid knew the threat he posed. However, Curbishley had observed that no matter how tightly marked he appeared to be, Mendonca had a knack of finding space in the area. 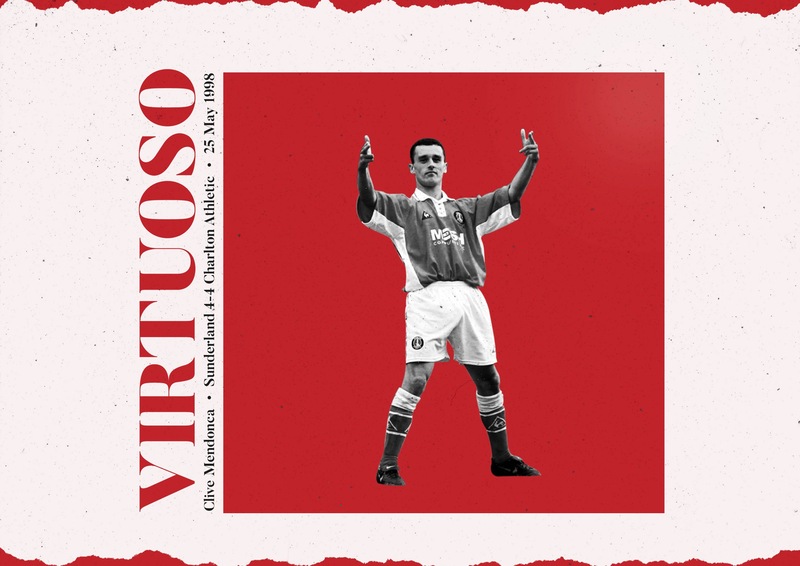 This was to be the player’s first ever appearance at Wembley and, in a bizarre twist of fate, his old Grimsby teammates had somehow already won twice at the Twin Towers that season, lifting the Football League Trophy and a triumphing in a promotion playoff. Wembley was about to witness a stunning display of goalscoring virtuosity. From the opening exchanges, Mendonca was intent on proving a point, despite the fact that members of his own family were there supporting Sunderland. On 23 minutes, he latched onto a pass and, with a brilliant dummy that left defender Jody Craddock kicking thin air, powered the ball into the net to give the Addicks the lead. At half-time, Charlton appeared to be on their way. The previous summer, a young Australian called Saša Ilić had been asking around bars in south London to see if any club needed a goalkeeper. After keeping seven successive clean sheets, he had now not conceded in over 14 hours of football. That was about to change in the most dramatic fashion. Within seven minutes of the restart, Ilić had been beaten twice as Sunderland led 2-1 with goals from Quinn and Phillips. Charlton were struggling to find a response until, on 71 minutes, a long pass over the top found Mendonca, who had anticipated the opportunity. His first touch diverted it away from two defenders and allowed him time to drill his shot into the bottom corner of Lionel Pérez’s net to notch his second goal. Charlton barely had time to celebrate as, within two minutes, some slack marking allowed Niall Quinn to restore Sunderland’s advantage. Sunderland needed the hero of 1973, Jim Montgomery, in goal but instead it was the error-prone Lionel Pérez, and his failure to deal with a corner allowed Richard Rufus to level the scores at 3-3 with five minutes remaining. Reid could not contain his frustration as his defence seemed intent on throwing the game away. Extra-time ensued and, for the third time, Sunderland took the lead after nine minutes through Nicky Summerbee. But Charlton refused to wilt. Four minutes later, a cross from Steve Jones found Mendonca standing unmarked between two defenders at the edge of the area. With a balletic swivel he controlled the ball and then, all in one movement, volleyed it to level the game. Mendonca’s goals were a combination of anticipation, awareness, grace and power. As his teammate Keith Peacock later said: “Time used to slow down for a moment when he had the ball in the box, he was so relaxed and confident.” His display single-handedly kept Charlton in the game as it ended 4-4. In the penalty shoot-out, Charlton’s talisman strode up to take the first one. He had scored from his last seven and, displaying glacial coolness, he lashed his effort into the roof of the net to give Charlton the advantage. Eventually, with Charlton leading 7-6, Sunderland captain Michael Gray’s penalty was saved by Ilić. Charlton were in the Premiership and, undoubtedly, it was the majestic exhibition of the goalscorer’s craft that had propelled them there. Clive Mendonca became the first player to score a hat-trick in a Football League playoff final, the first since Geoff Hurst to do so in a competitive final at Wembley, and was the very last person to score a hat-trick there. Outside of London, his achievements have never fully received the recognition they deserved but Mendonca is an all-time hero at the Valley and was inducted into the club’s Hall of Fame in 2012. Sadly, a persistent hip injury meant he had to retire from the game at the age of 32. He moved back to Sunderland where the locals did not bear any malice towards him. He was back to being a Sunderland fan. He even ended up working at the local Nissan factory on Wearside.